I just don't get it. What's so great about "Smile"? I'm talking about the Beach Boys' supposed "masterpiece" that allegedly would have beaten Sgt. Pepper. If only. "If only" seems to be all I hear from the “smile trekkies”. Don't get me wrong. I respect what Mr. Wilson tried to achieve on "Smile". It’s not easy to do a total 180 with your group’s approach to music and image. The whole mystique of these sessions is based entirely on the fact that they are UNRELEASED. "I've got a secret and it sure is great!" If "Smile" had been released, it likely would have been a critical success and commercial failure. "Heroes and Villains" didn't do as well as expected. "Pet Sounds", an album of milder songs than what has been heard of the "Smile" sessions was a critical success but didn't do as well in terms of sales as expected either. Look at what it would have had to compete with Jimi Hendrix, Beatles, and the whole Haight Ashbury sound. While Brian Wilson was talented in writing catch, empty jingles ("fun,fun,fun" "I get around","surfin' usa") his failure in the "Smile" project shows his inability to write more intelligent music (just contrast "God Only Knows" with "God" by John Lennon). None of the stuff on "Smile" seems terribly in tune with the whole hippie 60's thing. It just sounds “unfinished”. The “smile trekkie” counters with, “but you ought to hear the stuff in the vault”. Well, if it was that great, they would have released it, wouldn’t they? I've got several friends who are fanatical about the Beach Boys unreleased "Smile" album. I've gone to a couple of the websites, including a Smile message board, have listened to my friends bootlegs as well as the official "Smiley Smile" which WAS released in place of "Smile". Gotta love those "Smile" fan(atics), they are the little brothers of "trekkies" from the previous generation.. The speculation on the track order and other "what if" "Smile" related scenarios is mildly interesting at first, then comes off as being a bit pathetic. Whatever you say about a "trekkie" at least they can show you a finished product of their fanaticism; episodes, costumes, and other collectibles. A "Smile" fanatic can only go "here's MY theory on the track order" and wistfully go "If only". What other rock groups are lauded for "failure"? Certainly none I can think of. Pete Townshend couldn't finished the "Lifehouse" project, but the Who still got a damn good record out of it, "Who's Next". The Beatles “Get Back” didn’t work. It became “Let It Be”. “Sandanista” by the Clash was a failure, but at least it was released! I'd like to consider myself fairly well knowledgeable about rock and roll music. Hell, I'll even go out on a limb and say I know more and have better taste than 85% of the music fans out there. But I just don't get "Smile". At the end of the day, it IS an unfinished work. Its much akin to calling a football teach a winner when they don't quite make the touchdown. Getting close only counts in horseshoes and hand grenades; certainly not in rock-n-roll. 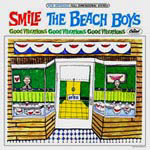 Even Brian Wilson himself distances himself AWAY from "Smile". In doing so, even HE acknowledges that “Smile” was a failure.